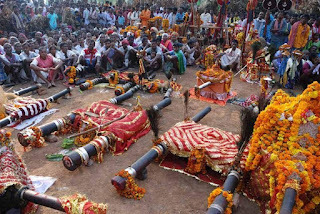 Now, let’s talk about other rituals being performed during Bastar -Dashhara. This is the third ritual. I have already mentioned other rituals in my previous blogs. Please clicks the links below to know them. Navratra and Dashhara begin with the establishment of urn at all the sacred places like temples &shrines. Urn-establishment is done on every auspicious occasion in Indian society so is on Dashharha too. 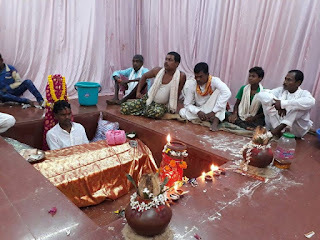 Urn is presented at the every holy place at the onset of Dashhara which include Danteshwari temple, Mawali Temple, Shitala Temple, Kankali Temple, Karnakotin Temple and Hanuman Temple located at the southern gate of the area. Lord Vishnu and Hanuman Chandi Baglamukh are also worshipped during rituals. 350 deities are worshipped and said to have visited Bastar from all over the region during the festival of Dashhara. Looking at the mass visit of deities across the region, Dashhara is the biggest religious event of the tribal in Bastar. For that a special pit is made at the building called Sirhasar where the man from Halba community sits every year in prayers to goddess to run the festival smoothly. The circumambulation of the chariot begins from the day. 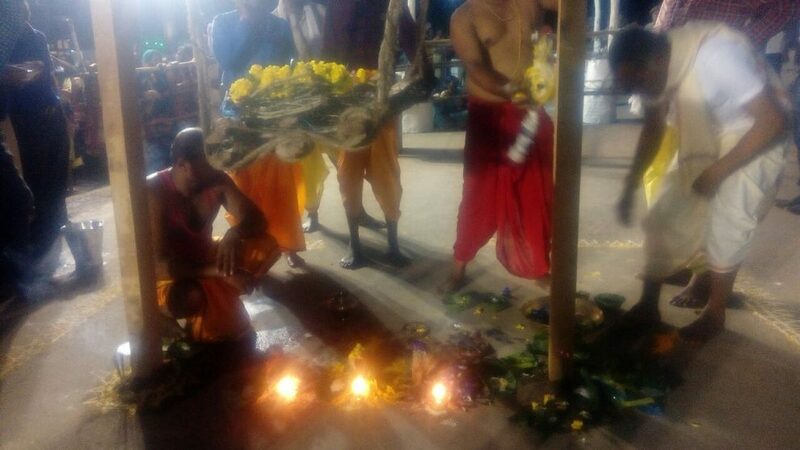 People from all over the world come to witness the chariot-circumambulation and the rest of rituals being performed during these days. District administration also sets up an exhibition to show its development and schemes launched for the welfare of the tribal. Thus Lokotsav (folk- festival) also begins simultaneously. In this way, people are bustling here in Bastar for almost 30 days together. Please don't forget to give your invaluable comments on the write-up.